We offer a range of materials and options for you to create and explore ceramics. Bisque is a type of unglazed, white clay, with a matte appearance and smooth texture to the touch. It has been once fired and is suitable for painting with acrylics or glazing and firing. Our pieces average $7 to $15 each. Greenware is a type of clay that hasn’t been fired. Our greenware is hand moulded locally. It is very fragile and soft, making it suitable for more sophisticated glazing techniques and etchings. Our pieces average $5 to $17 each. Clay is suitable for hand building. It is usually brown, grey or white and is soft to touch. There are three main ways to create something from clay, including pinch, coil, and slab techniques. Stoneware will cost marginally more than Earthenware when used in our studio (approx $10 additional depending on quantity. We stock a range of paints and glazes for use within our workshops, or you can choose to bring your own along. Our studio has the highest quality underglazes and paints from Mayco & Duncan in the USA and all are food friendly, non toxic. With no artistic talent at all you can still produce a stunning piece of ceramics. Japanese transfer papers are versatile and easy to use, making you an instant decorating professional. Our papers are $7 half sheet, $13 full sheet, $3 small size sheet. 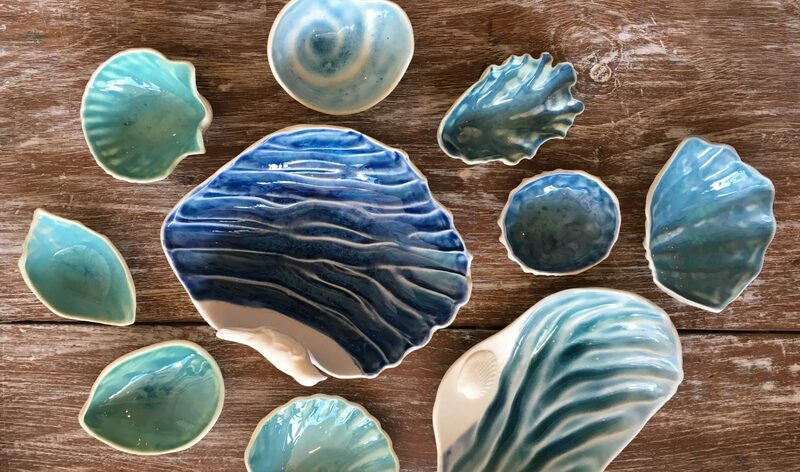 We have many unusual options to try when it comes to decorating your ceramic creation. If it can stand the heat of the kiln we are happy to give it a fire. All of our firing is done on site and usually takes around 10 business days to complete.